Find out how switching to eStatements results in higher than average paperless adoption, increased traffic to your portal and immediate, hard cost reductions plus dramatically increased security – all in this month’s edition of eBilling Insight. Paper billing and statement presentation are inevitable expenses. Billers, banks and other financial institutions are eager to go paperless for all customer communication. Despite investing significantly in online banking and online bill pay initiatives, many banks and billers have not achieved the necessary customer adoption rates to reach paper turn off targets. Adoption of paperless billing is achieved when customer convenience is prioritized. Simply put, when it is as easy as opening a paper envelope to get a statement, customers will turn off paper. According to the InfoTrends ‘Future of Electronic Bill Presentment & Payment’ report 2010: email is the electronic alternative sought by customers today. 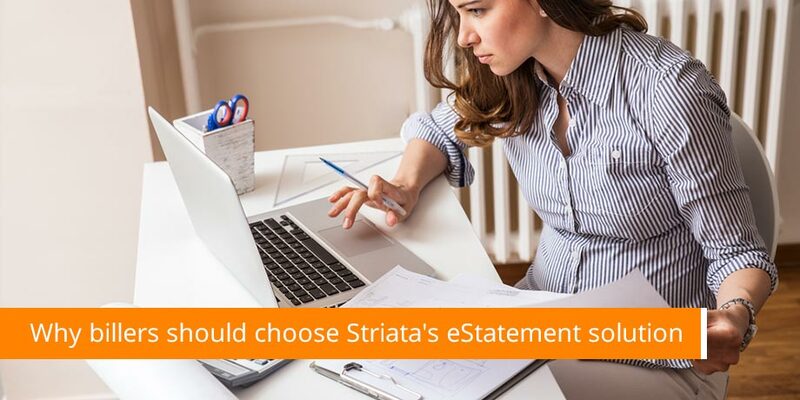 Customers receive the initial electronic version of their statement through an innovative ‘one click’ methodologyand agree to have all future statements delivered as electronic documents only. For added convenience customers can also save and view the eStatement offline or outside the email client, with all the security features intact. Because convenience drives customer adoption, this delivery channel can be used to expand and complement existing online services, ultimately helping companies achieve their paper turn off targets. Concerns over phishing for financial institutions are particularly acute. Consumers are wary of notification emailslinking to websites, due to constant phishing emails that attempt to mimic notifications. Striata eStatements, created as encrypted PDF or .emc email attachments, should only be accessed through the use of a shared secret, which is made up of personal data known only to the biller and the recipient, such as date of birth and last 4 digits on the credit / debit card. Security of the eStatement is fundamentally two-factor authentication; recipients need access to their email inbox plus knowledge of the shared secret. Security is further enhanced by the decryption process, which is offline and local to the recipient’s computer. Find out what makes Striata eStatements so secure.